NASA scientists are amongst researches saying that Earth is warming at an unprecedented pace. Average temperatures have risen in every US state since the early 1900s, causing extreme summers, longer wildfire and allergy seasons, declines in crop and livestock production, and the spread of tropical diseases to be more common. That's according to a new report by the National Climatic Data Center (NCDC), which looked at how temperatures have changed in the US since 1900. 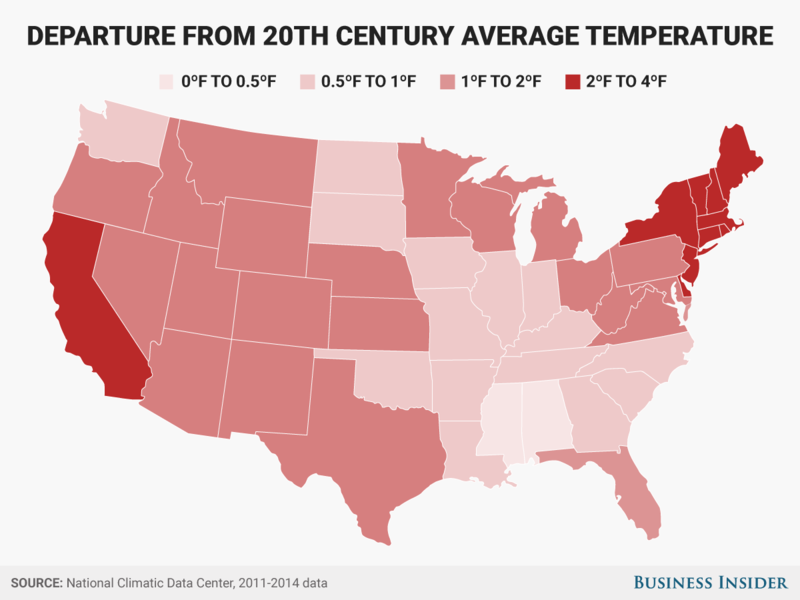 The NCDC calculated the average temperature for each state from 2011 to 2014 (the most recent data available), and then found the difference compared to its 20th century average. NASA scientists, among many other researchers, say that Earth is warming at a pace unprecedented in 1,000 years. The past three years were the hottest on record, and in 2017, temperatures have already reached their highest levels in history in some areas, from California to Vietnam. By the 2050s, New York City could see up to seven heat waves per year, with maximum temperatures at or above 90 degrees Fahrenheit for about 60 days — twice what the city currently experiences. The phenomenon is largely a symptom of climate change, accelerated by carbon dioxide emissions from the burning of fossil fuels. In an open letter published June 28, six prominent scientists and diplomats, including former UN climate chief Christiana Figueres and physicist Stefan Rahmstorf, wrote that the world has approximately three years before the worst effects of climate change take hold. As seen in the map above, in the majority of states, average temperatures have only risen around 1 or 2 degrees since the 20th century. That may not seem like much, but the country is already seeing effects from climate change (like the ones described above). The Paris Agreement, established in 2015, aims to keep global temperatures from rising more than 2 degrees, a threshold that scientists say would have catastrophic and irreversible effects on the planet. The US, which is now expected to leave the accord in 2019, set a goal to reduce national emissions 26% below 2005 levels by 2025.